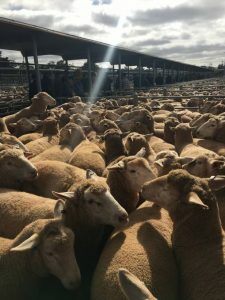 Australia’s lamb industry boom continues its record shattering run with lamb prices hitting a dizzying $256 a head at Ballarat sale on Tuesday. 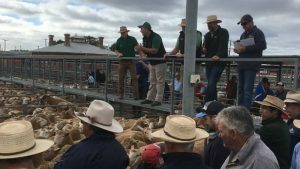 Opening bids began at $230 following whispers of a stronger sale than Bendigo the day prior – which peaked at $227 for 34 kilogram carcase weight shorn lambs – before the sale was thrust to “astronomical” heights. “Some days when you’re about to sell there can be an air of expectation,” Landmark Ballarat auctioneer Xavier Shanahan said. Bids skittled in $1 intervals to finish at $240/head for the sale’s opening pen before being smashed by the second pen of 105 lambs at $256. The top two pens were a part of a consignment of Poll Dorset-White Suffolk second cross lambs offered by Golden Grove, Newlyn, Vic. 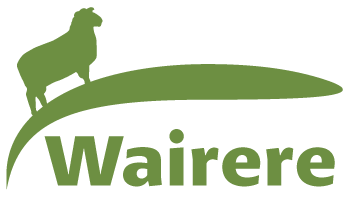 An Australian price record of $256 was set at Ballarat on Tuesday, paid for 105 Poll Dorset-White Suffolk second cross lambs, 36kg cwt, offered by Golden Grove, Newlyn, Vic. “When we bought the lambs in October the stakes were high but that’s the luck of the draw,” Mr Shanahan said. Of Landmark’s first run, four vendors offered 890 lambs for an average $235/head. Following the record sale, Mr Shanahan said the gallery was “shocked into silence”. “A lot of buyers were saying it is the dearest c/kg they’ve dealt with because of the low skin prices,” he said. “Processors can’t get enough lambs to fill their kill spaces to keep the plants running, although there has to be a resistance level at some stage. The trim 21169 head offered at Ballarat on Tuesday was met by palpable processor action, buoying prices $10-$15 higher, with select pens $25/head up on the week prior. Heavier trade weights sold from $152-$180/head, averaged about 680c/kg cwt. The unshorn lambs, mostly from southern areas, reached $188/head, while restocker lambs sold from $106-$139. 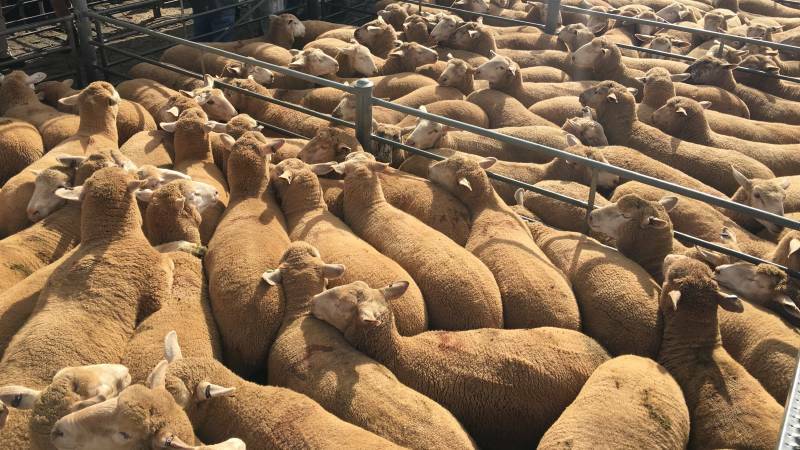 Light trade weight lambs sold from $118-$148/head, av 670c/kg cwt, while trade weight lambs sold from $142-$163, with the heavier weights from $152-$180/head. “No one knows where this market is going. Processors thought they would have a supply of lambs by now.” Mr Shanahan said. Australian lamb goes about 45 percent local market. No shipping cost, and much lower refrigeration cost, lower distribution cost too. There is a lot of promotion for lamb around Australia Day, January 26. And a shortage of supply this year, exacerbated by good feed conditions. Australia’s export lamb goes mainly to the US and Middle East, with only 20,000t quota for the EU. There are at least five times the number of jets leaving Australia every day, so air freight chilled is a much bigger percentage of total exports. Many of their lambs have a valuable wool on skin, worth only $8-10 currently, but NZ pelts and wool are worth about zero right now. Their type of wool suits ugg boots and some other end products. Note too, that a 36kg lamb is double the size of an average NZ lamb, and with no penalty for oversize because of the current shortage. But the meat plus skin was valued at $A7.11/kg, with the meat at $6.70/kg and the skin at $14.75….a very large skin provides more options for end products. It is worth adding that mutton has been between $A3.60-4.10 there in recent months. I also found an article on Google about the Australian lamb industry….check out domestic consumption of lamb there. Retail prices are about the same level as 2011, over $14/kg.